Beat the crowds - enjoy the rides 30 minutes before the park opens with FREE Early Park Admission up until 02 September (subject to availability, cancellation and change). Off-Peak Tickets: Represent fantastic value compared to the gate price, but can only be used on an off-peak date. Tickets can be activated on any day 1 January 2019- 7 Jun or 3 September-13 December 2019 , 6 January - 5 Jun or 8 September - 18 December 2020 and 11 January - 31 March 2021 so you are not restricted to the date selected at the time of booking should your plans change. Anytime tickets: Offer complete flexibilty as tickets can be activated at any time during the calendar year purchased including the most popular dates such as the Summer and Christmas holidays. From magical spells to magical creatures, from dark villains to daring heroes, it's all here at The Wizarding World of Harry Potter™. Explore the mysteries of Hogwarts™ castle, visit the shops of Hogsmeade™, and sample fare from some of the wizarding world's best-known establishments. 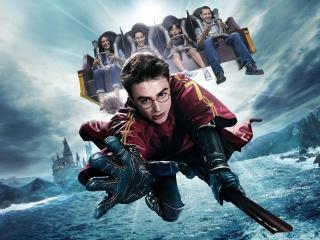 Plus experience pulse-pounding rides and attractions that transport you into a world of magical thrills and excitement. NEW for 2019: This summer, brace yourself for the opening of the new epic adventure- Jurassic World™ - The Ride - based on the blockbuster film franchise. Be there when the gates open to experience just how real it is! Hold on tight for the all-new grand finale, Fast & Furious - Supercharged! Ride along with the all-star cast from the hit movies on an exhilarating high-speed chase that catapults you into the high-stakes underworld of fast cars and international crime cartels .You’ll be engulfed in a world of cutting-edge, hyper-realistic special effects, including 3D-HD imagery projected onto the world’s most expansive 360-degree screens! Get a closer look at where and how your favourite movies are made on the world-famous Studio Tour. Keep an eye out for actual production of tomorrow's hit films as you tour through soundstages, Backlot streets, fantastic movie-making demonstrations and astounding special effects. Be part of the battle as you embark on a mission to defend the Allspark from the evil clutches of the Decepticons© in Transformers™: The Ride 3D. Experience King Kong 360 3-D. Your heart pounds. Your adrenaline flows. Your survival instincts are on overload. You’re caught in the middle of a terrifying struggle between a 35-foot T. Rex and the 8th Wonder of the World – King Kong. You’ve never experienced him this real before. Despicable Me Minion Mayhem - Join Gru, his daughters and the rebellious Minions on a heartwarming and thrilling 3-D ride. Start your journey in Gru’s home, where you’re recruited for his latest scheme – one where you’ll become an actual Minion. Enter the post-apocalyptic world of AMC’s “The Walking Dead” in a year-round attraction that is beyond your wildest screams! Prepare to fight for survival in a fully immersive journey as you navigate through a world overrun by hungry walkers. Plunge high speed into total darkness on Revenge of the Mummy℠ – The Ride as you escape the Mummy's revenge in life-like horror. Don’t miss the enhanced new Special Effects Show, where real Hollywood stuntmen and cutting-edge technology come together to recreate scenes from your favorite blockbuster movies! You will be sent a gate ready Universal Studios Hollywood e-ticket not a voucher, ensuring minimum fuss when you arrive at Universal Studios Hollywood. There is nothing to redeem and you simply go straight through the gate on arrival. Please note - If you are not travelling within the next 72 hours then it can take up to 7 days for your e-tickets to be uploaded. Early Park Admission begins 30 minutes before the Theme Park opens and is subject to availability, cancellation and change. Once booked and confirmed the Universal Hollywood Tickets are non-refundable and non-changeable. 100% cancellation fees apply.